In 2006 myself and my business partner Tina decided to take a bold step and ‘go it alone’ so to speak, we wanted to offer local residents a personal and expert service that we felt was missing from both the local area and the region on a whole that we both call ‘home’ and so after setting up shop in and old florists, Chariot Estates was born. In my spare I enjoy spending time with my friends and family, I am an active amateur swimmer and 8 times Masters National Champion, a successful Channel swimmer and the holder of many Staffordshire and Midland records. Along with David, I started Chariots in 2006 after becoming tired with the sales driven environment of the so called housing ‘game’. For me property is anything but a game, its people’s lives, homes and families, not something to take light heartedly. In my ‘spare’ time I am a full time mother of five, one of whom, Kim, works with myself and David at Chariots. 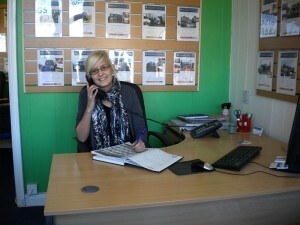 Kim Williamson – Sales and Lettings Negotiator. 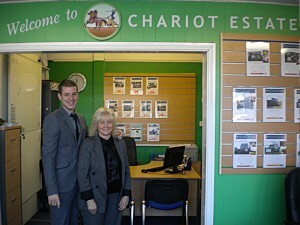 I joined the Chariots team in 2008 and immediately gained qualifications in both Estate agency and customer service so I could be the best of help possible to David and Tina. In my spare time I enjoy shopping, beauty and spending time with my boyfriend. 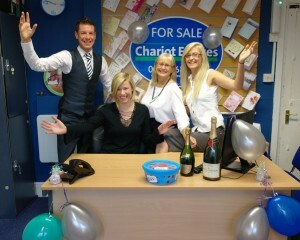 Clare Perks – Sales and Lettings Negotiator & the Team. Clare, David’ sister joined the team in 2014, with a previous expertise in banking Clare has a good knowledge of the “ins and out” of the process and what it takes to purchase a property. Clare is a previous Midland & Staffordshire County badminton player and regular goes spinning and body pump.